Zababdeh Local legend is that Mary and Elizabeth passed through this town as they visited one another. 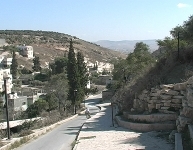 Zababdeh is the only majority Christian village in the northern West Bank, located seven miles southeast of the city of Jenin. 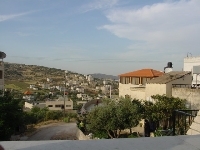 Two-thirds of Zababdeh's residents are Christian, belonging to the villages' four churches. The founding of the nearby Arab-American University in 2000 has meant economic and demographic growth, adding 1,000 students to the town's population of 3,000.
now ministers at the Latin Patriarchate Seminary in Beit Jala. Nablus A major urban center of the West Bank, Nablus has a population of more than 100,000. Known for its sweets and olive oil soap, Nablus is also home to An-Najah National University, the largest university in the West Bank. 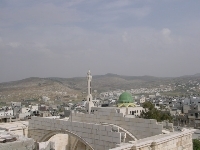 700 Christians live in Nablus, known Biblically as Shechem, one of the cities of refuge. Here, Jacob is believed to have dug a well (Genesis 33), and Joseph's remains were brought back from Egypt to their final resting place. At Jacob's Well, Jesus spoke with the Samaritan woman about the need for "living water" (John 4). Above Nablus, on Mt. Gerizim, lives the modern remnant of the ancient Samaritans; between Nablus and a community near Tel Aviv, they number just over 600. 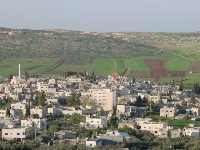 Jenin Jenin is the central city of the northern region of the West Bank. 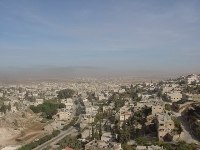 Its population is over 45,000, a third of whom reside in Jenin Refugee Camp. 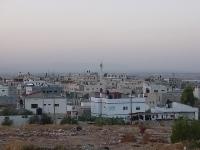 There are approximately 200 Christians in Jenin, belonging to various branches of the faith, but all worshiping at the city's one church, the Roman Catholic parish. The church is served by Fr. Alphonse along with members of the order of the Sisters of St. Anne. Burqin A mile to the West of Jenin sits the town of Burqin. Among its 10,000 residents are 100 Christians, a community which links itself historically to Christ's healing of Ten Lepers (Luke 17). The ancient church contains the cave in which it is believed the lepers were quarantined. Already a site of veneration, the cave was included in a church built by Saint Helena in the 4th century AD. The church has been expanded several times since then and still holds weekly worship services. In addition to this historic Orthodox church, there is also a Roman Catholic parish. Among Tubas' 16,000 residents is a small Christian community of fifty-five, worshiping at Holy Trinity Orthodox Church. A mere ten miles from the major urban center of Nablus, Tubas has been cut off from that city over the last three years due to Israeli military checkpoints and closures. The town is mentioned in the Bible by the name Thebez (Judges 9). Holy Trinity has an active parish council which recently constructed a new church library and fellowship hall. Located just inside the Green Line (the 1948 armistice line dividing Israel from the West Bank and Gaza), Jalame was once an important center for Palestinian-Israeli trade. Where was once a thriving market is now ruins and trenches, demolished to protect settlers as they travel past, and to make way for the Israeli Wall. The town's population of 1,500 includes fewer than one hundred Christians who are closely related to those in the village of Muqeible just on the other side of the Green Line. They are served by the Roman Catholic priest of Jenin, when he can pass through checkpoints to get there.